Walking the 2010 LA Roadster Show, I started snapping shots of the dazzling chrome works of four-stroke art found in the roadsters and hot rods in the show. 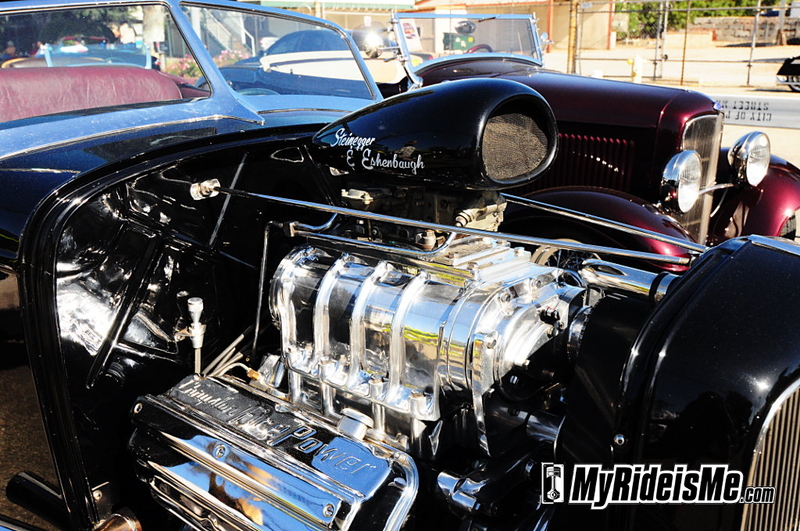 Where else to place the prized and uber-rare speed parts for your flathead than out for the world to see in an open engine bay? So let’s put it to a vote. 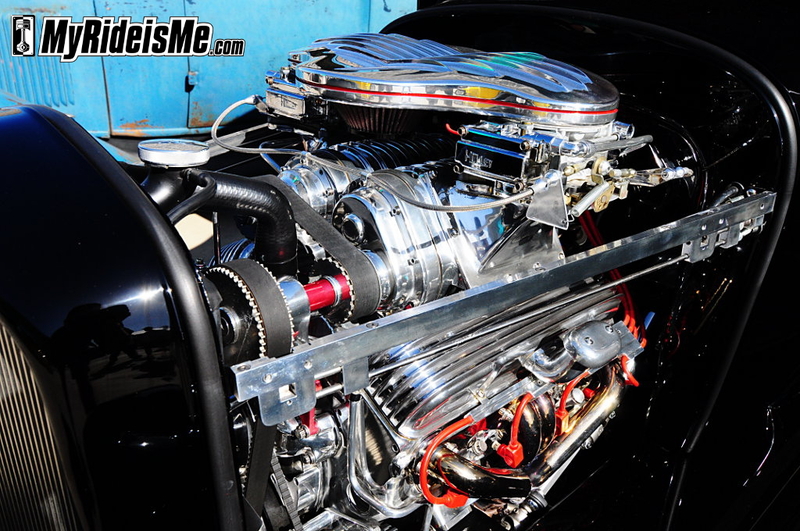 Pick a favorite and MyRideisMe.com will send a T-shirt to the top 3 engines. Easy for me to say! To do that, I’ll need help! If you know the owner or know the owners cousin or even want to know the owner… leave a comment and help us get in touch. Owners of these engines: Please email to moc.eMsiediRyMnull@senignEtseB. You might have won a t-shirt! 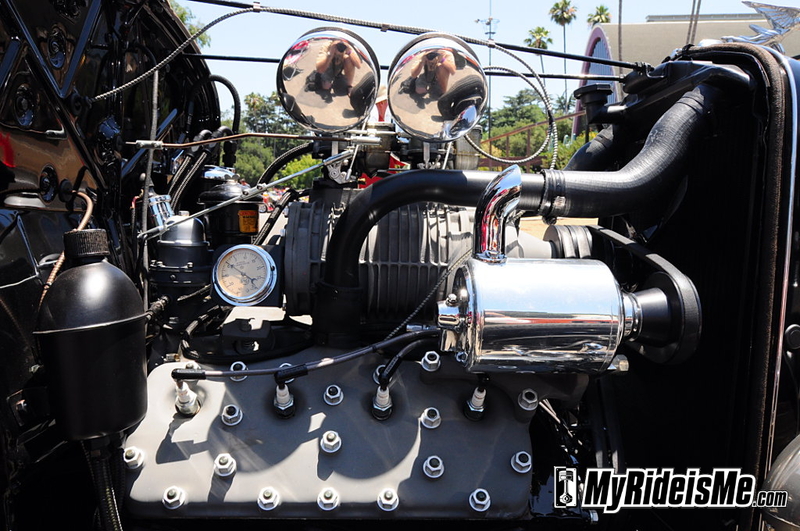 Let us know the details of the build and how this engine shows why, “My Ride is Me”. For every picture here, click on it for the full size image. #6 Blown Flathead. Who can tell me about the “Internal Syphon Gauge” mounted behind the blower. It’s made by GE and has a + and – 30 PSI range. The trick curved air cleaners really set this one off. 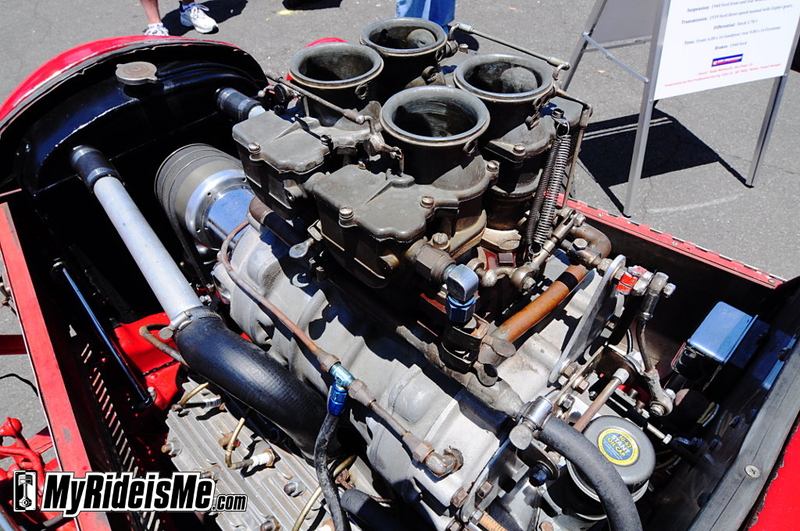 #8 Quad Carbed Offenhauser Flathead. I saw a NOS Beehive oil filter like the one shown here for $450 at the not-to-be-missed LA Roadster Show swap meet. Nostalgia ain’t cheap. That’s it. 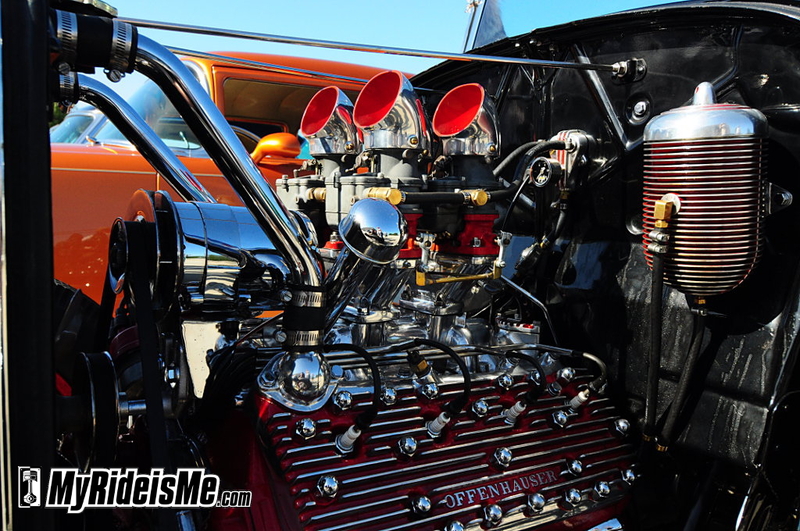 13 of the best looking, best detailed engines of the LA Roadster Show. Care to pick a favorite? 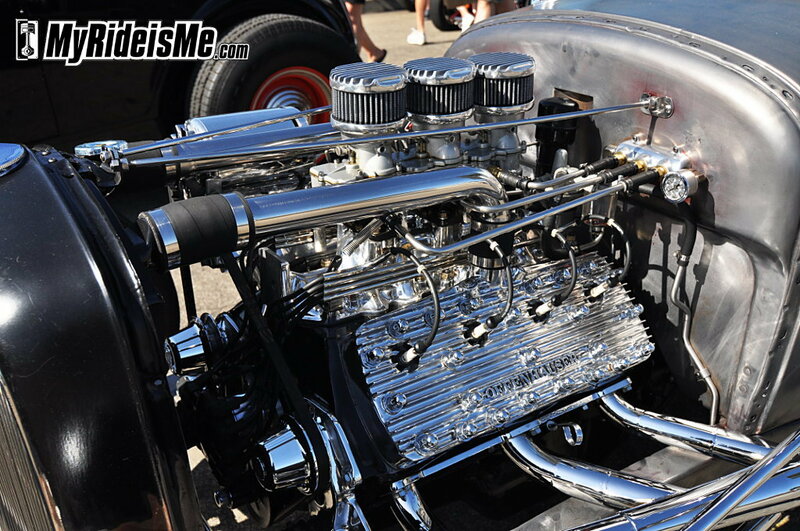 Pick your favorite hot rod engine then say why in a comment below. #11 Gurney Eagle & Weber Carbed Big Block Ford? Wow, that was kind of hard to pick just one. 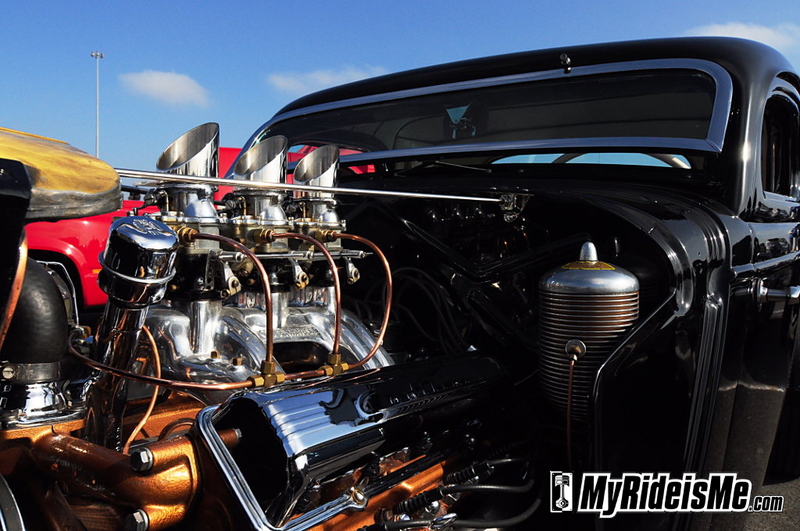 I liked the Shine flatty and the Tbird with that gorgeous exh mani, but I had to go with the tri powered Caddy motor. That’s the motor I’d want in my roadster. 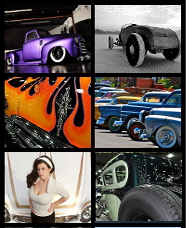 Thanks for the great shots of the roadsters. Especially your # 1 pick. A note on that great ’32 with the Harrell Racing Equipment for those who didn’t make it to the Roadster Show. 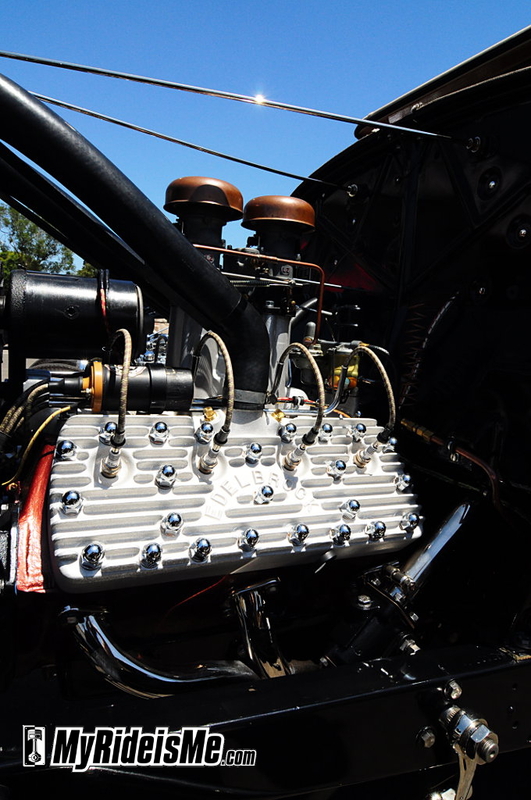 The car was built by Joe and Jay Kennedy of Pomona for Jim Jard of Texas. 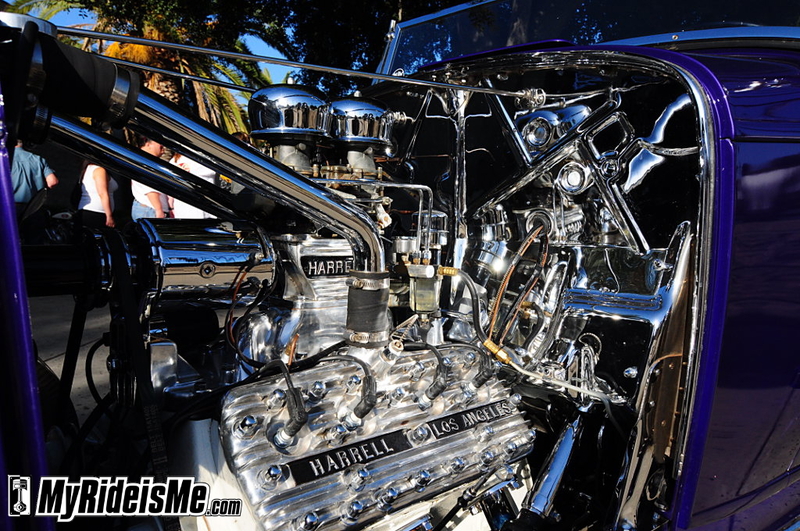 For more information on the Harrell Racing Equipment it sports and a full picture of the purple roadster, see: harrellengineshotrodding.com. One only one will do ..go with the Big Bad Blown Elephant. Clean lots of detail and you just know it shakes the ground, what more could you hope for. I oppologize to all the flatheads because they are a piece of art all by themselvs. 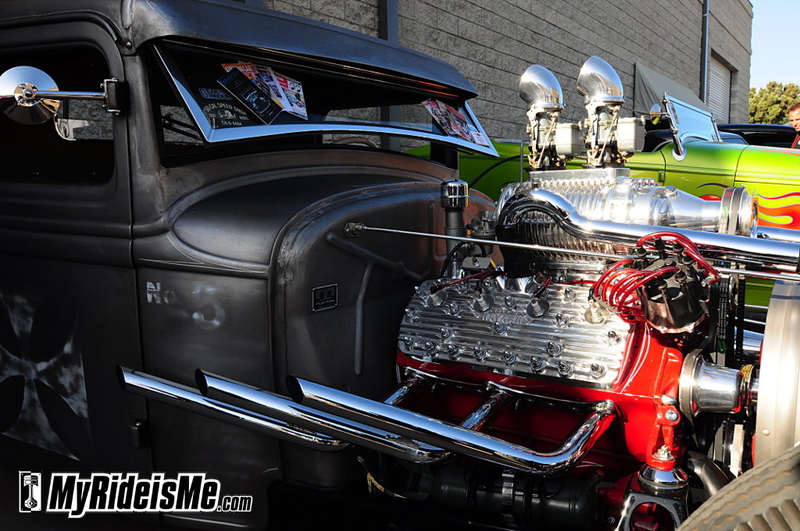 but I had to pick the Big Block ford # 11 because of the amount of creativity and creature feature looks of the motor all by it’s self. I can see that in any car that I would drive and it would look crazy and fit the bill. 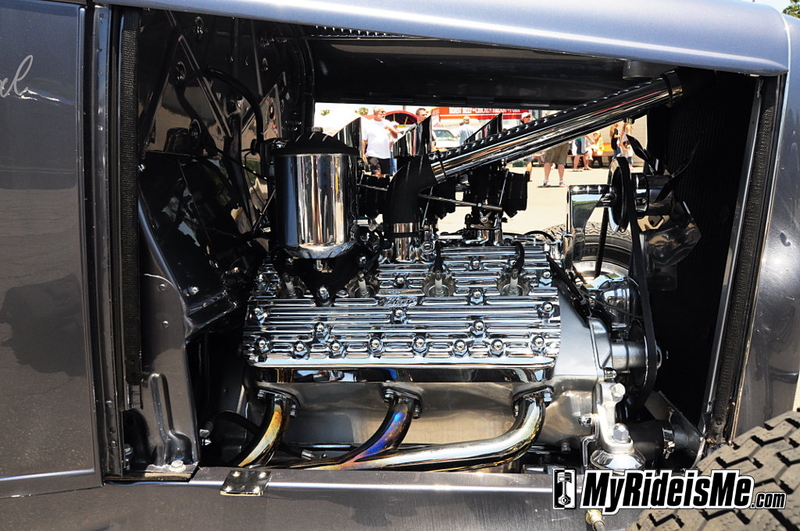 I wish I had my caddy motor cleaned up and at the show. you can check it out on my page. I was a friend of Rich and Roger Harrell and their Uncle Nick. 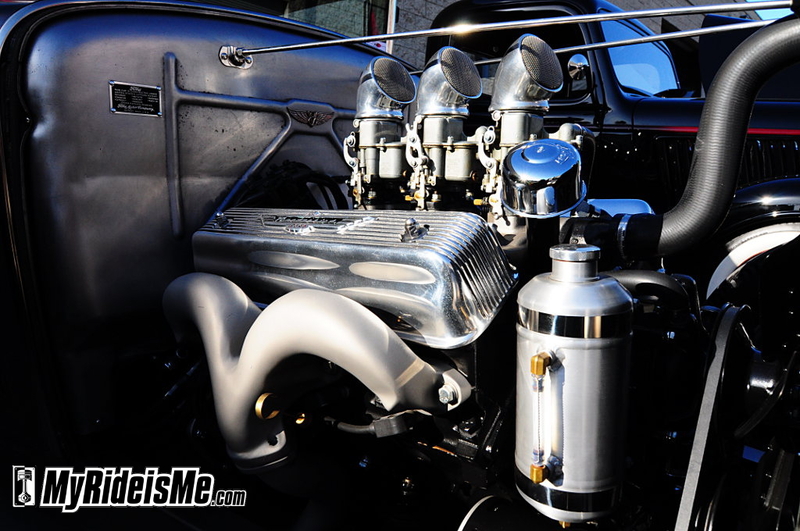 Harrell Engines got me interested in hotrodding. I can remember one day at the shop on 109th and Main St. when Nick wanted to push start his 1934 Ford Coupe ( The Don Bell Special No. 75 ) and let me behind the wheel. When I popped the clutch and that Harrell engine fired up, I had the opportunity to feel some real gravitational power. Those were the days my friend, and I never will forget the thrill of that short ride down 109 th. street. Harrell Racing brings back many great memories from my days in So Calif. What a great team they put together and what fantastic racing cars, machines & equipment they are resposible for. I picked the Y-Block ,T-Bird engine because of it’s outer beauty and I know the torque from it’s long stroke would tear apart any transmission or rear end ,from dropping the clutch at 4 grand. Hey Mike, thanks for the comment. 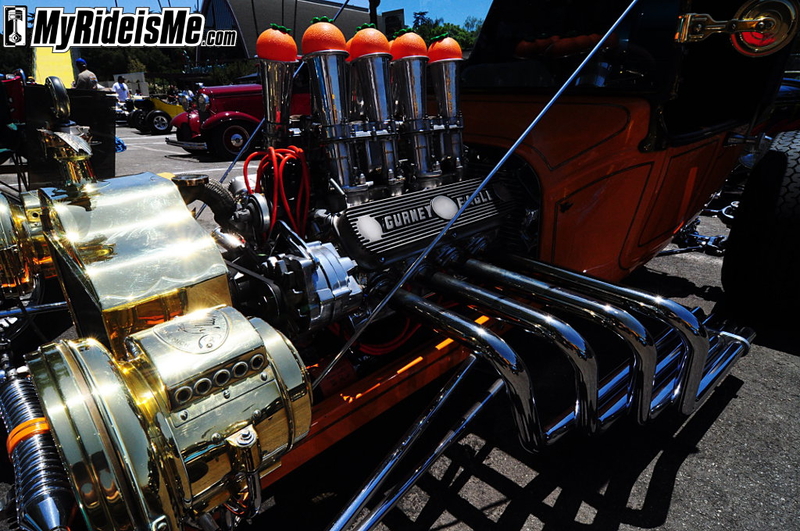 I think there’s a Gurney motor in this month’s Hot Rod Magazine? I’ll have to research what that means and how hostile it’d be in a little T-bucket!